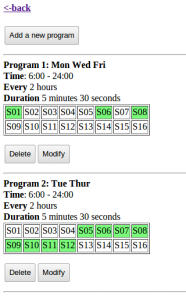 Program-based scheduling. 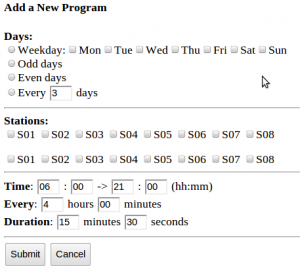 Each program consists of a set of days (including weekdays, odd/even day restriction, and interval days), stations, start, ending, interval, and water time. The firmware supports up to 64 programs. Choice of running stations either sequentially or concurrently. Graphical Preview of each day’s program. Integrated Manual Mode. When activated, the manual mode allows turning on or off stations using buttons on the homepage. An optional timer can be set to automatically shut stations off. Support for rain sensor and location-based weather checking. Details can be found in the video below, and the OpenSprinkler Instructions of Use page. This software version is compatible with all existing hardware versions, including v1.0, v1.1, and v1.2u. Feel free to give it a try. To find out how to re-program the MCU with new firmwares, please refer to the Re-programming Instructions. 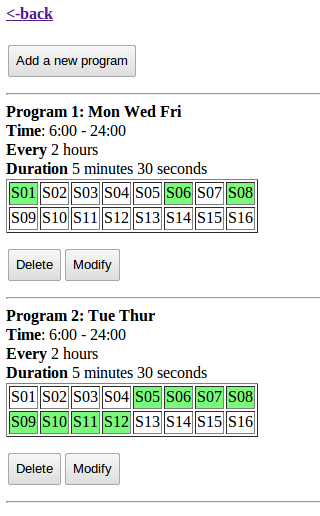 From now onw, the new interval program will replace the previous svc_full_schedule program, and become the default program shipped with all pre-flashed MCUs. The Weather feature you saw in the demo video above is implemented using a Python script and Google Weather API installed on the Rayshobby server. This is an example of Server-Side processing, because the Python script runs on the server and not in your browser. The reason this requires server-side processing is because first, the Google Weather API returns fairly long XML data that cannot be directly parsed by the MCU, second, the MCU needs to periodically retrieve weather data, so it needs to initiate requests on its own and cannot rely on the existance of a web browser. Thus the Python script serves as a mechanism to convert complex XML data to microcontroller-readable format, and since it runs on the server, the microcontroller can send requests to it at any time. OK, so much for the technical details. There is no way to cover all details in a single post. If you want to find out more about how the software works, please refer to the source code, or post a message on the forum. A couple of new products have been just added to Rayshobby Shop page. 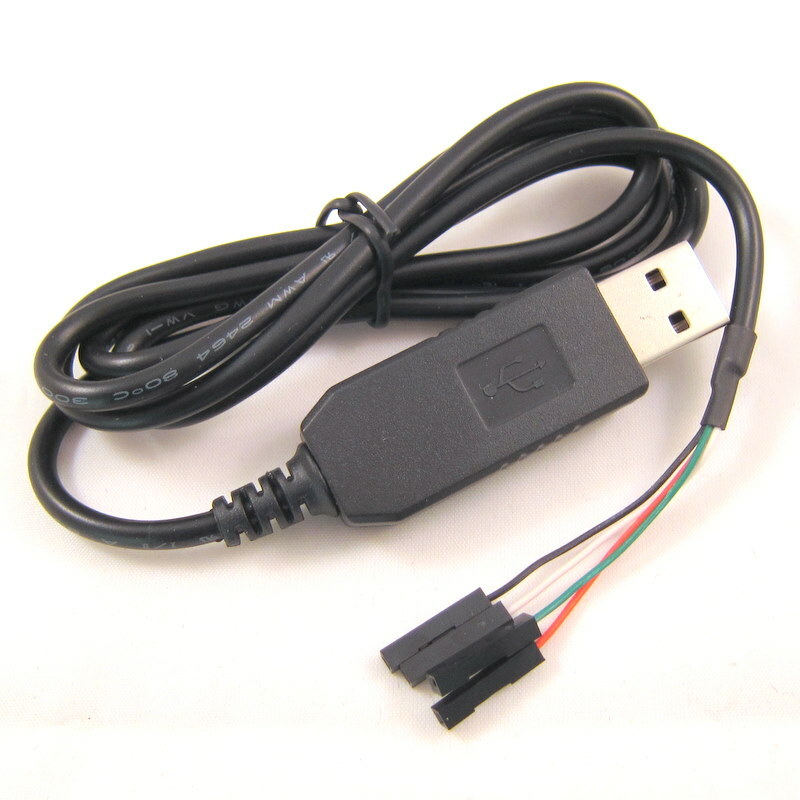 These include a 434MHz RF transmitter and a USB-to-Serial (RS232) converter. So what are they good for? 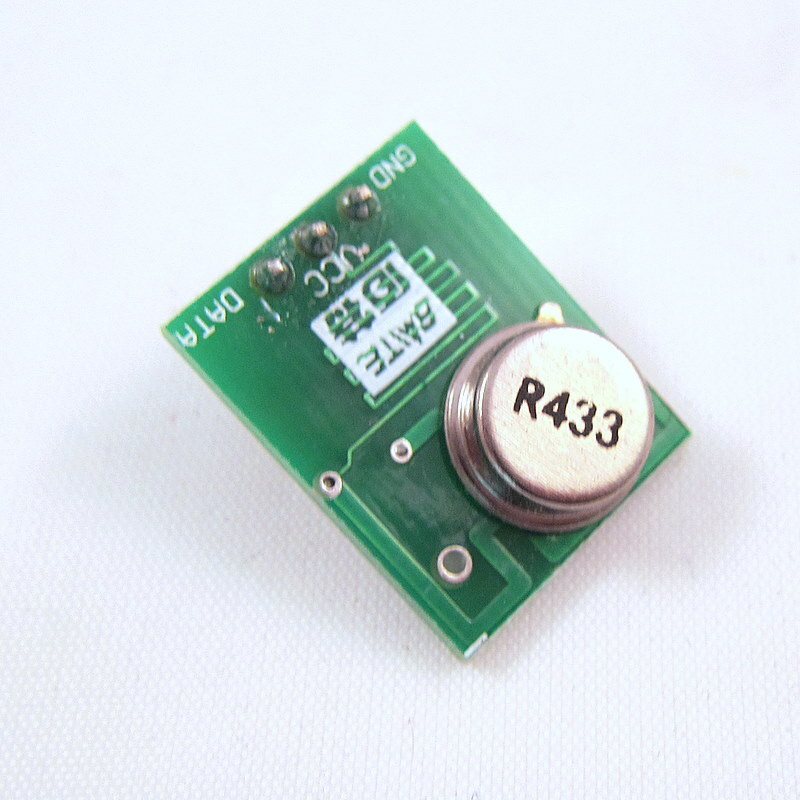 The 434MHz RF transmitter is a general-purpose RF transmitter with on-board PCB antenna. It is compatible with SparkFun’s 434MHz RF transmitter. You can find a lot of example code online, including Arduino code. The module has three pins: Vcc, Gnd, Data. The operating voltage is 3~12V (5V standard), and the current draw is about 5-15mA. The higher the voltage, the longer the transmission range. Typical transmission range without external antenna (i.e. using on-board antenna) is 160 feet; and it extends to 500 feet with an external antenna. I’ve shown an example use of the transmitter in a recent article A New Way to Interface with Remote Power Switches. It provides a simple way for a microcontroller to switch wireless power sockets. Very handy and inexpensive for home automation projects. On Mac or Linux, you don’t need to install any driver: it is already supported by the operating system. On Windows, you can download the driver following the link here. Once installed, the device will report as a Serial COM port. You can then use any Serial Monitor to communicate with your microcontroller. Some standard serial monitors are Arduino’s built-in serial monitor, Putty, or gtkterm (on Linux). I’ve been using this converter a lot for printf debugging of OpenSprinkler code. Again, both of them are now available for purchase on Rayshobby Shop page. Why using a switching regulator? Since OpenSprinkler uses a single power supply (i.e. 24VAC sprinkler transformer), it is necessary to step down 24VAC to 5VDC and 3.3VDC in order to provide power to the circuit. The simplest and most common way is to use a 7805 linear regulator. But here is a catch: due to the relatively high current consumption of the ENC28J60 Ethernet controller, the whole circuit draws about 150 to 180mA current during operation. Using a linear regulator in this case will cause a lot of power waste. 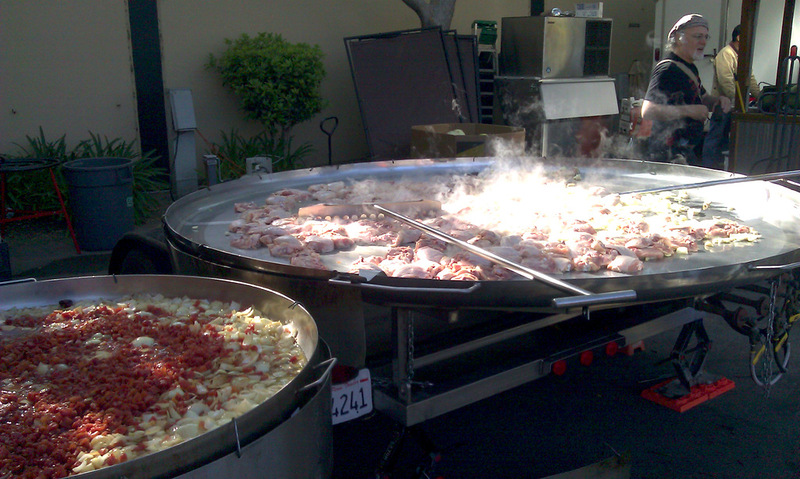 Specifically, (24-5) * 0.18 = 3.42 Watt will be wasted on heat due to the voltage conversion. This is pretty bad. That’s why I made the conscious decision to use a switching regulator to achieve higher efficiency. The switching regulator in this case is estimated to have 75% efficiency, so the power waste is more like (5 * 0.18 / 75% – 5 * 0.18) = 0.3 Watt. Much better and green! Why having both 5VDC and 3.3VDC supply voltages? This is because the LCD requires 5V supply, and the rest of the circuit requires 3.3V. The microcontroller can work with both voltages, but the ENC28J60 Ethernet controller and the RFM12B transceiver require 3.3V. That’s why the circuit provides both 5VDC (VIN) and 3.3VDC (VCC). Why using triacs to control solenoids? What about relays? While a lot of other sprinkler control circuits found online use relays to switch solenoids, I made the conscious decision to adopt triacs. There are many reasons this is more preferable. First, triacs are semi-conductor components, so they are much smaller than relays, more durable and act much faster. Second, they are low-cost and significantly cheaper than relays. Third, they are also slightly more power efficient: each triac requires only 5 to 7 mA holding current to switch on solenoids, while relay coils often consume more current. In fact, a sophisticated design can use an AC triggering circuitry to trigger triacs only during zero crossings, further reducing the power consumption. All in all, triacs are great choices for switching low-voltage AC devices. 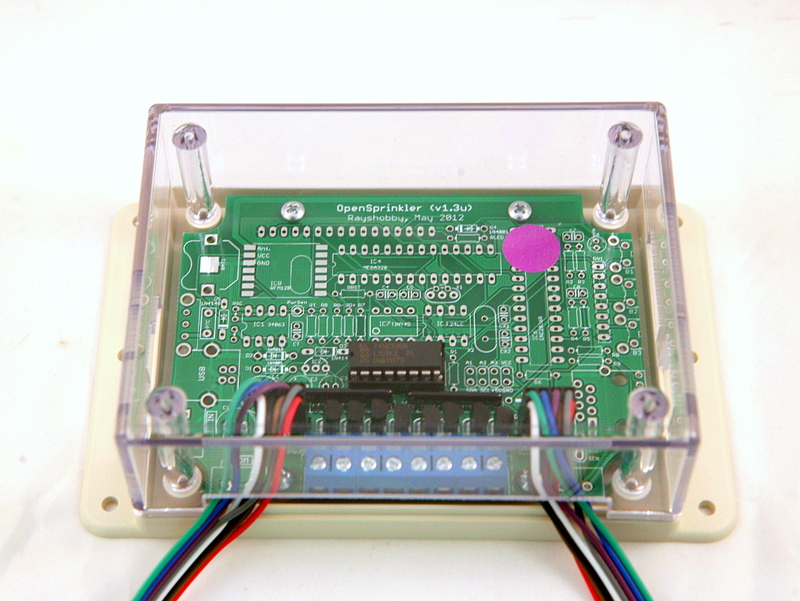 Why does OpenSprinkler v1.2 adopt a USBtiny programmer? 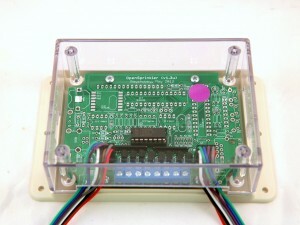 If you’ve noticed, the previous versions of OpenSprinkler relied on external FTDI programmer. That was designed to be compatible with standard Arduino and variants. The main advantage of FTDI is that it not only does re-programming, but also it is a USB-to-Serial converter, which allows the microcontroller to easily send and receive messages from your computer. However, it also has two main downsides. First, it is expensive: an FTDI programmer or cable can easily cost more than 15 bucks, and we don’t like to stock it due to the cost. Second, using FTDI requires a bootloader, which takes away some (512 bytes) program space from ATmega328. 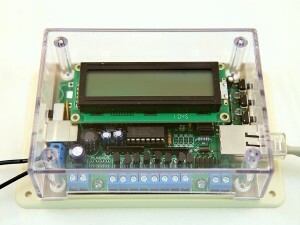 Therefore we have decided to go with an on-board USBtiny ISP programmer based on ATtiny45. We like this solution a lot better because this way every OpenSprinkler board has a built-in USB programmer, so you don’t need to worry about purchasing a programmer separately. It is low-cost and does not require a bootloader, so it’s a win-win choice. 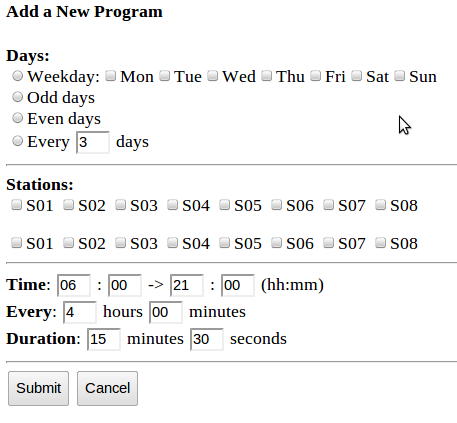 The idea is that you can define many ‘schedule items’, each of which consists of Time (which can be a weekly schedule, odd or even day schedule, or every N day schedule), selection of stations, start time, end time, interval, and duration (down to seconds). You can add as many such items as you want, subject to the EEPROM size. These pages are not looking beautiful yet, but with the trick mentioned above, they can potentially look much more fancy. Something else I’ve been working on is reverse engineering RF signals sent from remote temperature and humidity sensors as well as wireless rain sensors. There are lots of these off-the-shelf remote sensing transmitters that you can buy at very competitive price in retail stores. These transmitters typically work in 434 MHz RF range. I’ve found a simple method to reverse engineer their RF signals, and I’ve successfully decoded data from a temperature and humidity sensor. Hopefully I will be able to figure out the rain sensor as well. It has been great fun, and I will devote a couple of posts soon to describe how I did it. All right, so much for today!